Coal – Next Hipster Trend is what's HAWT, NEXT! 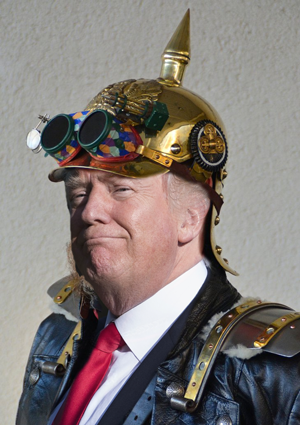 With his triumphant rejection of a unified global response to climate change (#fakescience) and his affirmation of the need for a return to coal, President Donald J. Trump outs himself as the REAL steampunk. From Babbage’s brass gear computing to coal fired forestry robots the days of steampunk as a mere hobby for overpaid millennial IT workers are OVER, the coal fires are here, they’re HAWT and they’re MAINSTEAM. Alright, we aren’t suggesting that you begin construction on a gigantic steam-powered tarantula ala the seminal steampunk opus “Wild, Wild, West.” What we are suggesting is that you demonstrate acceptance and tolerance for the ways of our new leader in quizzingly and impressional ways. Rig a tiny furnace to your desk fan and lazily toss a lump of the classic combustible strata in. Stoke the fire with a miniature bellows while looking over your shoulder at the morning meeting with the Bob’s. When the office Greenparty Action lunch clutch starts up, stand all “il duche” over them and sharpen a few #2’s with your steam powered pencil sharpener. A subtle cough to simultaneously simulate black lung AND communicate your disapproval of the Paris accord will add the proper emphasis. If you really want to wow them (you do), tote around a dead canary in a cage (#deadcanary). That will make them think.